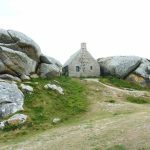 La pointe du Raz : a view that takes your breath away! Here, you’ll feel on top of the world! 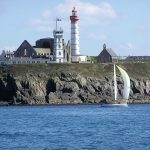 The view of the sea is breathtaking, with the cliffs and rocks and the ile de Sein in the very centre. The Torche is a surfing spot scoured by the wind and the sea. Hikers will be dazzled by the beauty of the countryside, the storms and the marshes. In Spring, the Torche is covered in daffodils – a beautiful, colourful vision. 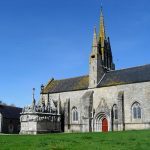 Imagine a village entirely of stone, with medieval alleys and facades, ancient granite houses, an entirely natural décor that has attracted many film makers (Claude Chabrol, Chouan…). Just 5 minutes from the house is the place where you must go for lunch or dinner. The view from this little port is absolutely magnificent – postcard material! You’ll see the constant movement of boats on the sea, and you can also make out Bénodet. 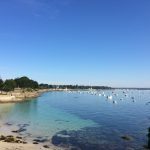 The pointe de Sainte Marine gives way to a long white sands beach, ideal for water sports or just relaxing on (and its possible to walk there from the house). The excellent seaside resort! 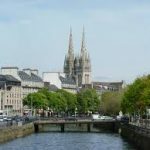 With its casino, its spa, its cinema, its boat trips along the Odet or towards the Iles de Glenan, its beautiful walks along the Corniche, its lively port, its restaurants, campsites and numerous concerts in summer… In short, Bénodet is ideal for holiday makers in search of things to do. Paul Gauguin visited here, and set up his school. This small, 19th century commercial town is renowned for its mills and its port. 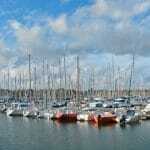 Harbour town and former Brittany stronghold, Concarneau has a rich patrimonial architecture. Within the shelter of the walled town, the sea deposits fish. There are many white sands beaches in the near vicinity. The jewel of the fouesnantais seaside resorts. 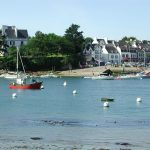 A mere 1 hour boat ride from Bénodet and Sainte Marine, you’ll find yourself in a group of small islands with their sparkling, clear waters. A paradise for divers, walkers, or just simply those who want to truly relax. Don’t forget your camera so that you an immortalise your boat trip from Kerascoet – a typically Breton area with its “standing stones”. 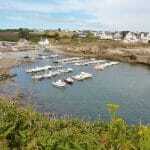 Then go and admire the pretty cove with its bathing huts still perfectly preserved at the Port Manech. Beg Meil , its coves and its beaches. This is an adorable little port where you can reach Kermor beach, opposite the farm. The port reminds me of a little Greek village with its small, flower-filled passages. Its cinema, “le Cinéma du Port” holds the record for having the smallest projection booth in the world! I love walking in this town full of art and history, through its little paved passages from the middle ages. Its timbered housing, its river Odet, its cathedral, and all the shopping, are all things to be admired about this town. This is a really impressive structure on the dunes, opposite Audierne bay. This beautiful Calvary shows the scenes from the passion, sculpted in granite. Absolutely magnificent! Nature is queen in this fantastic landscape where the extraordinary, legendary forest rules. A few centuries ago, chaos struck the Parc Régional d’Armorique. The nature had suddenly changed: large round rocks had appeared and built up. What a picture: a house nestled between rocks. What a place! 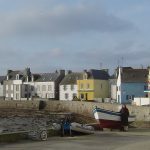 In the hamlet of Kerlouan (in North Finistère), all the cottages deserted by the military, peasants and fishermen, have now been carefully restored, one by one. 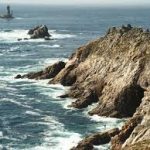 La pointe du Raz : a breathtaking view ! You’ll truly feel on top of the world! The view of the sea is mind-blowing, whilst you can also make out the little island of Sein, tucked between the cliffs and rocks. The ruins of a former abbey, lit up by a lighthouse, situated on the sheer cliff edge, battered by the wind and sea. It is to be found on la pinte du Conquet. 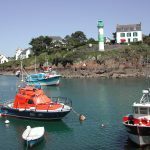 Situated at the West of the Crozon Peninsular, Camaret has a mad charm. 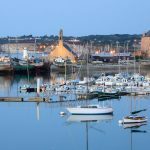 You’ll discover it for yourself going to see its port, its beaches, la pointe de Pen Hir and the Tour Vauban, classed as a Unesco World Heritage Site. Come and admire coasts whipped up by the spray and waves and some beautiful landscapes. Time will stand still during this trip that’s both peaceful and revitalising. You’ll feel completely at one with nature and the natural elements. 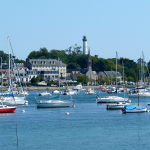 Take the boat from the port du Conquet or at Brest to find yourself… at the end of the line! Once arrived on the island, you can make a circuit by bike, admiring the houses with their blue shutters… you’ll be in the middle of nowhere, suspended between the sky and sea, on this island enveloped by wind and waves! A little in the distance, the little sister of Ouessant, Molène, a charming island, is just a few more minutes away by boat. You are here in Bigouden. The ile Tudy slightly resembles a Greek island with its narrow streets, low houses and long, white sands beaches. A camper’s paradise and also a great place to swim. A little further on, between the river and wood, the port de Sainte Marine is to be found, which really is enchanting. 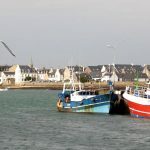 Roscoff is well worth the detour. 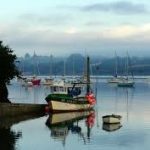 Built on an open peninsular, you’ll be enticed by the beautiful ship-owner’s houses, the flamboyantly gothic church, the port and the seaside resort. 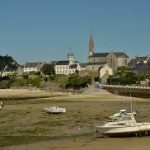 Opposite, the Île de Batz with its soft climate is perfect for relaxing. 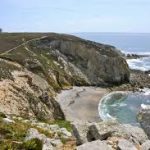 Just a 45 minute crossing from Lorient and you’ll be ready to take on the steep paths of the island by bike. 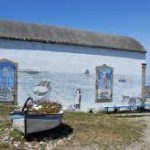 In the village with its low houses and its coves of crystal clear water, you’ll really understand the meaning of the proverb “whoever sees Groix, sees joy”. “A fragment of land in the ocean” which you’ll be able to discover during your ambles around the pebble fields and on the wind swept moors. This is a lively island with restaurants and bars and many cheerfully coloured houses. A lovely atmosphere allowing you to re-discover yourself. The lighthouses that guide the fishermen safely into port, and give earthlings dreams of supernatural forces. Faced with the challenge of the rocks, thanks goodness the lighthouses help the fishermen by highlighting the most dangerous areas. 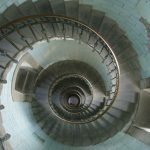 Penmarch lighthouse is the highest point in Bigouden: a truly grand position… And a bit of a strain on the legs (with over 300 steps to get there)! The panorama is amazing from a high vantage point, with the sheer cliff edges that go right down to the sea. Perched from 100 metres up, you will be able to admire Douarnenez Bay and Morgat Cove. 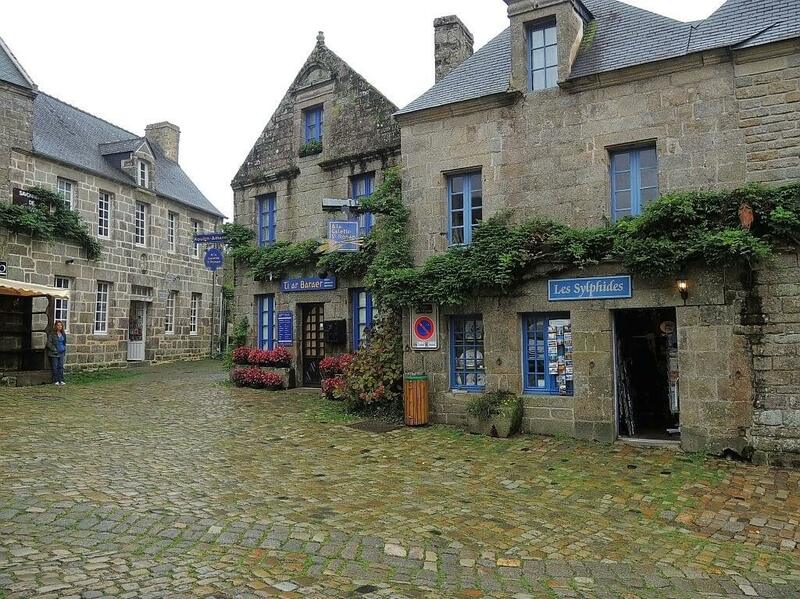 The perfect representation of Brittany in just one view! Have you ever tried the strawberries of Plougastel ? 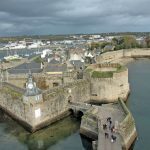 Come and discover this beautiful corner of Brest harbour, its magnificent calvary, its little ports, its chapel and Daoulas Abbey. You will be pleasantly surprised by the micro-climate of this peninsular and the fertility of the land. Just 5 minutes from the house is the place where you must go for lunch or dinner. The view from this little port is absolutely magnificent – postcard material! You’ll see the constant movement of boats on the sea, and you can also make out Bénodet. 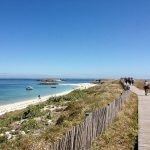 The pointe de Sainte Marine gives way to a long white sands beach, ideal for water sports or just relaxing on (and its possible to walk there from the house). 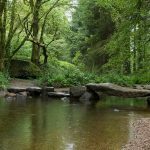 This lovely little port can be reached on foot from Kermor Beach, opposite Kerscuntec Farm. This port reminds me of charming Greek villages, with its little flowery streets. Its cinema “le Cinéma du Port” holds the record for having the smallest projection booth in the world! This colourful spectacle can be witnessed between 16:30 and 17:00. 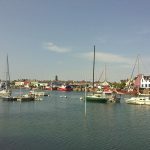 You’ll be a part of the excellent harbour atmosphere. Buoys, rusty chains, colourful boats, gulfs in search of fish, you’ll certainly see prawns and other monkfish when the fishing boats come in. If you’re an early riser, you can even go out on a fishing trip! 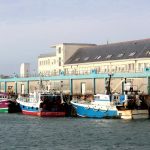 This is one of the most important ports in South Finistère. Here, yachters and fishermen share their landing platforms with boating champions. 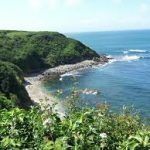 One of the treasures of this little port de Pors Poullan, perched up on the clifftop, is the statue of Bigoudène inspecting the sea and watching over the boats. Port de Doellan, everything here is inspired by the sea ! After the port at Sainte Marine, this is one of my favourite places. It’s the chosen setting of the actor B. L’Hermitte to film the series “Doc Martin” – he was also converted by this lovely little place. Here everything is inspired by the sea ! This little cove in Nevez is so beautiful, with its old stone-roof houses, as though out of an oil painting! Here, you’ll be won over straight away. 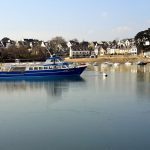 Yes, that can happen in Brittany… it’s possible to witness in just one day a great variety of weather. 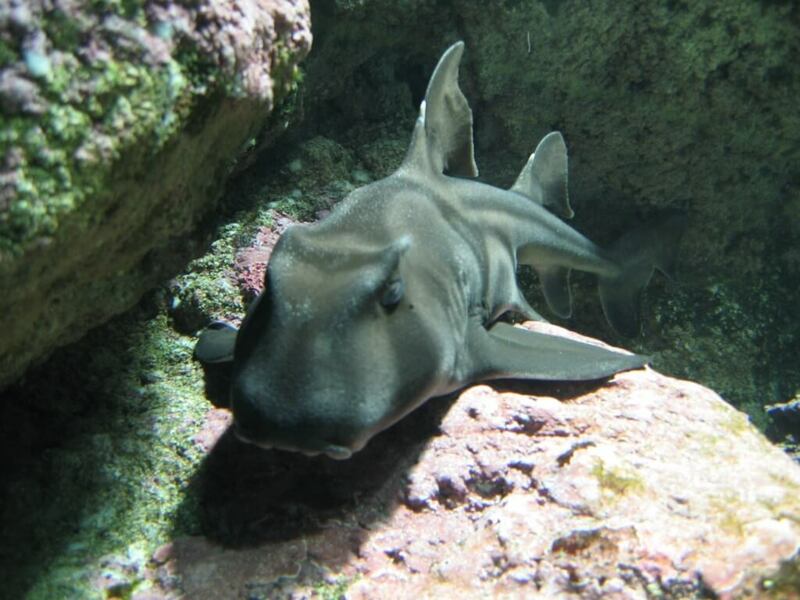 Go and pamper yourself in the spa at Bénodet, or swim in their seawater swimming pool. 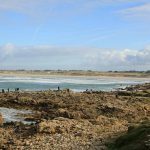 La Pointe de La Torche ou la Pointe du Raz if you want to feast your eyes on unleashed nature and a raging sea. Rare species of beautifully coloured plants in the botanical gardens of Cornouaille. Hide yourself in the cinema at the Cinémarine in Bénodet. Have fun in the playful swimming pool (toboggans, Jacuzzis) at the Balnéides in Fouesnant. 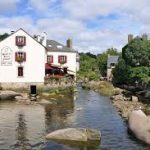 Be cultivated in the pleasures of former Brittany at the la maison des jeux in Saint jean Trolimon. Go and become one with the nature and wildlife of 3 gigantic aquariams “Tempéré”, “Tropical” et “Polaire” at the Océanopolis in Brest. Admire the stunning earthenware works in the faïencerie Henriot. Try your luck (and win the jackpot?) at the Casino in Bénodet. Go and discover the world of fishing, you will be able to get on a boat… watching out for seasickness! Take photos of the storm. 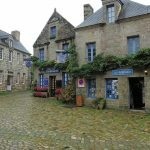 Visit Locronan, medieval town that is just as charming in the rain. Go and visit some castles. Or if not, go and enjoy a delicious salted butter crepe accompanied by a bowl of cider on the port de Sainte Marine, whilst admiring the different stages of the storm. What a feeling!